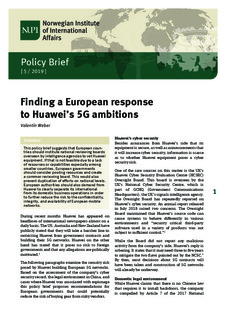 This policy brief suggests that European countries should institute national reviewing boards overseen by intelligence agencies to vet Huawei equipment. If that is not feasible due to a lack of resources or capabilities especially among smaller countries, European governments should consider pooling resources and create a common reviewing board. This would also prevent duplication of efforts on national levels. European authorities should also demand from Huawei to clearly separate its international from its domestic business operations in order to further reduce the risk to the confidentiality, integrity, and availability of European mobile networks.